A robber who pretended he had a gun by sticking his finger in his pocket but was seen off by two businesses he tried to rob has been jailed. Brian Cawley demanded cash from a Tesco and a bookmaker in Paignton, Devon, but fled when his bluff was called. He also tried to break into a home but was confronted by the 87-year-old householder, Exeter Crown Court heard. Cawley admitted two attempted robberies and a burglary and was jailed for three years and four months. The court heard 53-year-old Cawley went into the Tesco and Betfred shops on 22 April and threatened to shoot staff unless they handed over cash. Staff in the bookmaker also refused to give him money and said they were calling police. 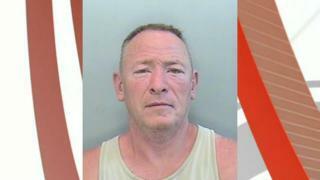 Cawley, of Hill Rise in Galmpton, Devon, was tracked down five days later when he broke into a house and was confronted by an 87-year-old, who also saw him off. Sentencing him, Judge Timothy Rose said: "Fortunately, people stood up to you. "Even if they didn't think you had a real gun, they could not be sure and the lady who told you to clear off must have been fearful of what you might have done if you did have a gun." Warren Robinson, defending, said Cawley was a heroin addict desperate for money who did not succeed in stealing anything and left without causing any violence.